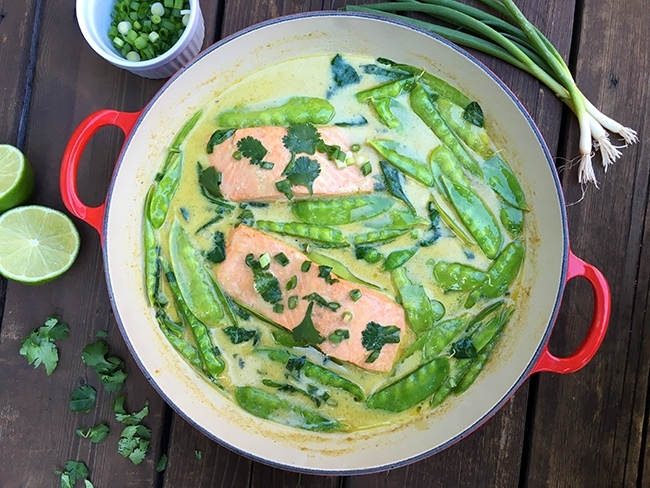 This green curry salmon recipe, compliments of James Beard award-winning cookbook author Diane Morgan, proves weeknight dinners can be fancy without the fuss. Last week I was thrilled to see the first fresh wild Alaskan salmon of the season at my local grocery store. It was an excuse to put friend Diane Morgan’s beautiful new Salmon cookbook to the test. After flipping through all the mouth-watering recipes in her book, this recipe jumped out at me as being both simple and unique. I love making flavorful curries and hadn’t thought to try one made with fish. Being a veggie lover, I couldn’t resist tossing in a hearty handful of baby spinach in the last couple minutes of simmering. I also substituted coconut sugar for brown sugar. Since I was using my favorite potent green curry paste, Oregon-based Thai and True, I scaled back to slightly less than 1/4 cup. If you prefer less spice than start out with 3 tablespoons of curry paste and you can always taste and add a little more curry at the end of cooking. This recipe is great served on top of jasmine rice, short-grain brown rice, or quinoa. Open the can of coconut milk without shaking it. Spoon out the thick cream that has separated and risen to the top. Set the cream aside in a small bowl. Pour off the remaining thin coconut milk and reserve it separately. In a large sauté pan, warm the coconut cream over medium-low heat. Add the curry paste and whisk until smooth and the mixture comes to a simmer. Add the sugar and stir until dissolved. Add the thin coconut milk, water, and fish sauce and bring to a simmer, stirring once or twice. Add the salmon fillets in a single layer, turn the heat to low, cover, and simmer for 5 minutes. Flip the salmon, re-cover, and cook for 2 minutes longer. Scatter the snow peas around the salmon, submerging them in the liquid, re-cover the pan, and cook until the snow peas are bright green and the salmon is cooked through, about 2 minutes longer. Remove the pan from the heat. Transfer the salmon to warmed dinner plates or shallow pasta bowls. Stir the lime juice, green onions, and cilantro into the curry sauce. Spoon the curry sauce and snow peas around the fillets, dividing the sauce and peas evenly. Serve immediately. Elyse Kopecky is a whole foods chef currently co-authoring a cookbook for runners, Run Fast Eat Slow, with Olympic marathoner and longtime friend, Shalane Flanagan. After 10 years working for Nike and EA Sports, Elyse decided to pursue her passion for talking and writing about food. She went to NYC to study culinary nutrition at the Natural Gourmet Institute and has taken cooking classes throughout Europe, Africa and Asia. Sign-up for sneak peeks of Shalane and Elyse’s book at runfasteatslow.com or follow along @ElyseKopecky.